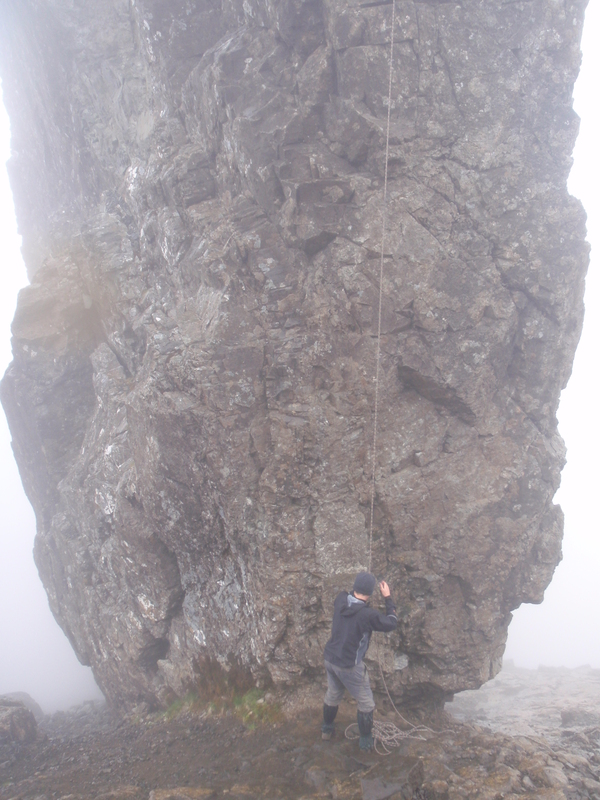 Munro number 59 was a tricky one: Inaccessible Pinnacle, the only Munro that requires climbing expertise. There are two ways up. By the west ridge – a vertical climb, rated vdiff. 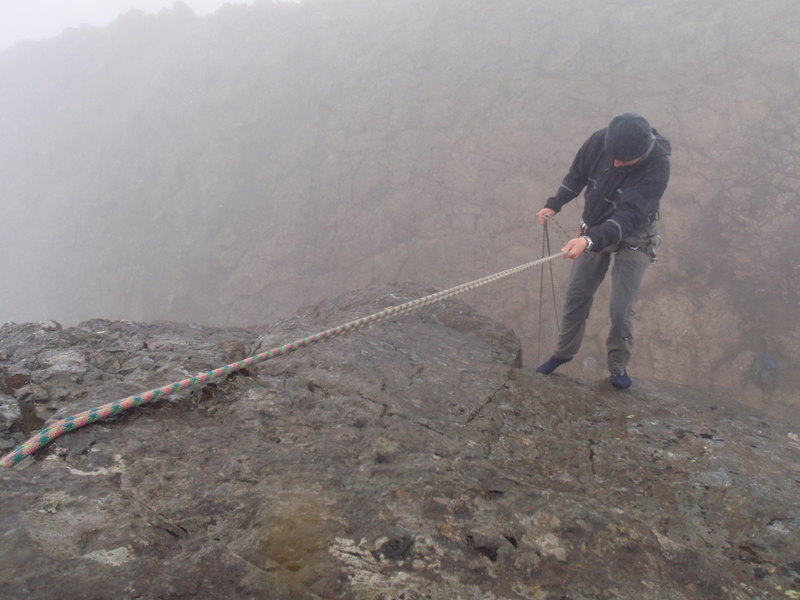 Or by the east ridge – an airy, exposed scramble, rated moderate. We gained Sgurr Dearg and the base of Inaccessible Pinnacle by Coire Lagan and the An Stac screes, ascending in pea-soup mist. The great shape of Inaccessible Pinnacle loomed above us, vast and, as its name would suggest, seemingly unclimbable. Having made the effort to drive west from Inverness and to clamber uphill for two hours, Inaccessible Pinnacle should be climbed the hard way. At least that’s what my climbing partner, Magnus, reasoned. ‘You know I’ve never climbed outside before,’ I reminded him. ‘Yes,’ Magnus said, as he disappeared up the wall, placing gear in various places, before shouting down shortly after that he had made the summit. ‘Climbing,’ I shouted, nervously, as I threw a leg onto the rock. For some minutes, I was poised on a little ledge, barely a metre above the ground, going nowhere. My prospects seemed hopeless. I was hideously out of my depth. First outdoor climb? On Inaccessible Pinnacle, the vdiff route? What madness. There seemed to be no way up, nowhere for my hands, nowhere for my feet. I was overcome with self-doubt. Drizzle started to fall. I can’t do this, I told myself. The easier east ridge was my get-out-of-jail card. 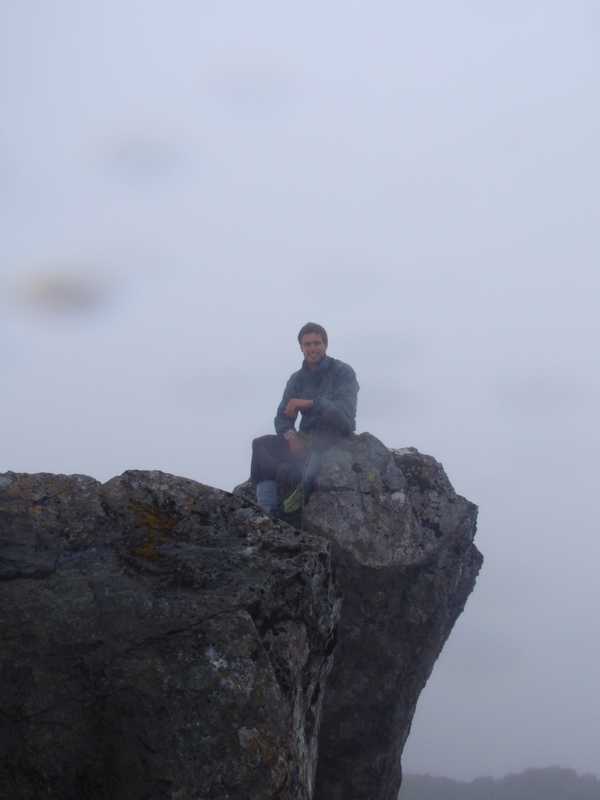 If I failed on the west ridge, there was always the east ridge, I reassured myself. But that was the wrong way to think. Besides, Magnus was not going to let me off lightly. He tossed down his climbing shoes. They were a couple of sizes too small, scrunching my toes, but I jammed my feet in. I went back to the wall with renewed determination. This time I didn’t hover and procrastinate. There was nothing to fear. The same holds that previously felt useless were now my ladder to the summit. I hauled myself upwards, screaming at Magnus to keep the rope tight. It was ungainly and unpretty, but in seconds I was up, wondering what all the fuss had been about. We could barely see the ground through the mist. Skye was invisible. I peered over the lip of the east ridge, scoffing at its ‘easiness’. Confidence invariably breeds arrogance. Ten minutes earlier, I was a failed, pathetic would-be climber. Now I was Bonington, Cool and Hillary rolled into one. Still, no-one could take this away from me: conquering the inaccessible. Well done on Highland Cross – full of admiration and empathy for the cramps – though I have to admit they attack me when I’m in bed and half asleep so I can’t claim any sympathy for that!